The African Innovation Foundation (AIF) is calling on all African innovators to submit their entries for the fourth edition of the Innovation Prize for Africa (IPA) competition. The IPA is presented annually enabling and encouraging African pioneers to develop creative ideas and techniques to overcome some of the challenges faced by the continent and support sustainable development. The IPA is becoming integral to facilitating ground-breaking thinking, creativity and driving awareness to the outstanding work being done in Africa by Africans. 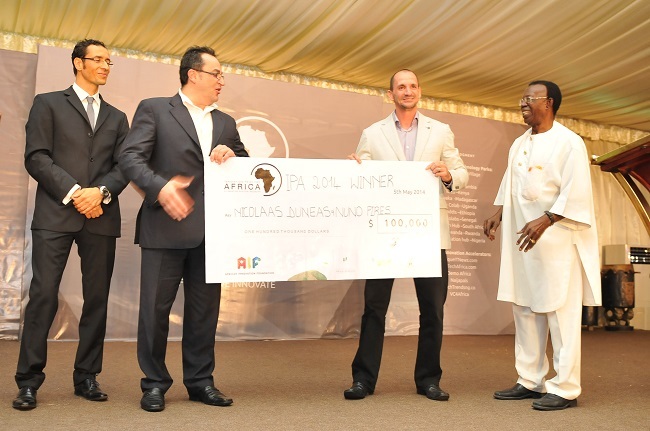 IPA 2013 winner, AgriProtein went on to raise $11 million to build its first two commercial farms in Cape Town. “Africa needs meaningful investment to alleviate poverty and provide inclusive prosperity. To achieve this, we need to be able to provide environments that promote quality investment for the people and reduce risks. Forums like the IPA are necessary to make the most of the continent’s investment,” said AgriProtein spokesperson, David Drew. All innovations are evaluated based on the following criteria: originality, marketability, scalability, social impact and scientific/technical aspects. The best submission will be awarded a grand prize of USD 100 000. The second prize of USD 25 000 will be awarded to an innovator with an innovation which has the best commercial and business potential. An additional award is a special prize granted to the innovator whose innovation has the best social impact in the community. The IPA encourages entries in five key categories: Agriculture and Agribusiness, Environment, Energy and Water, Health and Wellbeing, ICT applications, and Manufacturing and Services Industries. Recognising home grown innovative ingenuity, the prize contributes to increased funding of start-ups, adoption of new and emerging technologies and accelerated growth of the private sector. With ever changing economic and social environments, it is critical that proposed solutions tackle issues affecting African lives, and that they are effective and are different from the existing ones. IPA 2014 named Dr Nicolaas Duneas and Mr Nuno Pires from South Africa the winners of the grand Prize and received USD 100, 000. for their Altis Osteogenic Bone Matrix (Altis OBM TM), the first injectable porcine derived BMP medical device in the world — an innovative product for the treatment of bone injuries and voids through the use of a regenerative biological implant. The IPA also beckons all investors, governments and other stakeholders interested in evaluating, investing and maximising the continent’s resources to participate in this innovative and empowering initiative and make a significant change through generous contributions that will accelerate Africa’s economic growth. The deadline for submitting applications for IPA 2015 is 31 October 2014 at 24h00 GMT. For more information on competition categories, conditions of entry, and submission details, please visit: http://innovationprizeforafrica.org/.